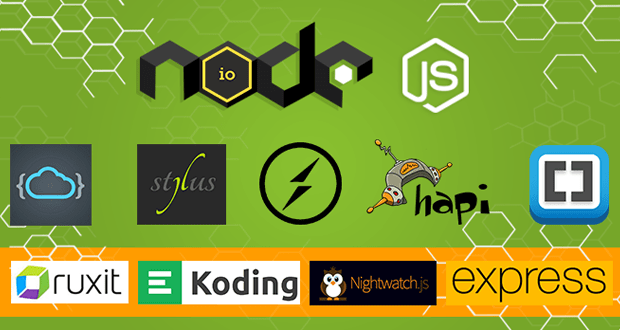 A lot of frameworks and tools are built on the Node.js platform for creating real-time, web applications. These are desktop integrated development environments (IDEs), online code editors, debuggers, frameworks for building dynamic websites and more. So, considering this, there is a question worth asking. What are the popular Node.js tools? To answer this important question, I have decided to list down 13 best Node.js tools that are currently creating a buzz in the sphere of digital technology. Alright, so let’s take a look at the capabilities of Node.js and Node.js tools in detail. Brackets is an advanced code editing tool combining visual tools with text editor. The tool allows making changes to CSS and HTML and offers real-time previewing to see the changes getting reflected instantly on screen. It also lets live previewing to check where CSS selectors are being applied in the browser by simply moving the cursor on it. Brackets provide an inline editing window to avoid annoying pop-ups while coding. Its extension, namely Extract for Brackets allows pulling information and other details, like font, color and layers from a PSD in the form of relevant code hints. Brackets works great with preprocessors and allows using Quick Edit and Live Highlight with LESS and SCSS files to make working easier with them. Koding is an online programming platform with a browser-based terminal operating on the virtual machines (VMs). The platform offers developers to code online in a web browser and to run codes with a real development server. It lets developers write and run applications in several programming languages, including Ruby, Python, C, C++, PHP, Node.js and more. Here, you can easily run and debug programs without having to download the software development kits (SDKs). Moreover, Koding includes an activity feed allowing users to collaborate together, exchange ideas, post code snippets and more. Koding executes its own CoffeeScript-based application framework for applications within the Internet Development Environment (IDE). Codenvy is another browser-based, programming environment to write server-side applications with Ruby, Java, Python or PHP. It integrates with several hosting platforms, such as Amazon Elastic Beanstalk, AppFog, Cloud Foundry, Google App Engine and more. Primarily, Codenvy offers a user-controlled, container-based platform with predefined build/run/debug environments. Its primary features include, source-code manager integration, debugging tools and more. Ruxit is a SAAS-based (Software As A Service), application performance management cloud service. It is an important tool for Node.js monitoring for databases, services and browser activities. The tool shows important metrics for each service in a single location. Ruxit offers real user monitoring (RUM) for Node.js applications and also provides a detailed synopsis of performance degradation. Express.js is a Node.js web application framework for building a host of web and mobile applications. A lot of popular applications like MySpace, Geekli.st, Klout, Segment.io and Yummly are powered by Express.js. It is a flexible framework for creating application programming interfaces (APIs). Express.js is offers various features, like middleware, template engines, simplified multiple routing, database integration and more. Hapi.js is a robust framework for building application program interfaces (APIs) and other software applications. It offers a gamut of features, including input validation, configuration-based functionality, flexible plugins, error handling, logging and more. Hapi.js is extensively used for designing graphical user interfaces (GUIs) and dynamic pages. A lot of popular websites use Hapi.js, including LOB, Disney, Concrete, PayPal, Walmart and more. Stylus is an expressive CSS language for Node.js framework. It offers a variety of spectrum features, such as optional colons/semi-colons, single-line/multi-line comments, arithmetic, interpolation, transparent mixins, in-language functions and more. PencilBlue is a full-fledged Node.js content management system (CMS) and blogging platform. The platform has built-in tools for SEO and relational data management and can be easily hosted anywhere, even cloud systems. PencilBlue has built-in support for MongoDB, AngularJS, Bootstrap and jQuery. Unlike other platforms like WordPress or Squarespace, with PencilBlue, it is easier to build a perfect-looking modern website. Passwordless is an open source framework for deploying token-based, one-time password authentication on websites. It is a token-based authentication middleware for Express and Node.js. Passwordless helps in avoiding hassle of creating separate registration and login page as well as lost password landing page. It is user-friendly and offers better security to the users. Passwordless is a node.js module for Express.js allowing authorization by sending tokens via email or other means instead of passwords. Paperclip.js is a template engine for Node.js web applications that compiles HTML to DOM. It can be used in Backbone, Angular or Ember-based applications. Paperclip.js comes with a set of operators that allow defining blocks that are unbound or one-way/two-way data-bound. Moreover, it is not browser-dependent and lets optimizations to happen at compile time. With that, we come to the end of this list. I am sure you must have found this post informative and interesting. Let me tell you that there are numerous Node.js tools out there and I may have missed out on some important ones. But, I strongly believe that the readers who are inspired by this blog post will definitely try to explore a few more useful Node.js tools. You can also check out one of my most liked post “5 Free Beginner Friendly Books for Learning Node.js” to help you learn this awesome technology. So, if you stumble upon a new name worth sharing, then feel free to mention it in the comments section below. This entry was posted on Monday, May 4th, 2015 at 08:57 and is filed under Resources. You can follow any responses to this entry through the RSS 2.0 feed. You can leave a response, or trackback from your own site. Abhishek is a content developer and writer at Codecondo. He loves writing and sharing topics on web development, designing, web programming and latest trends going around in web world. Fantastic submit, very informative. I wonder why the opposite experts of this sector do not notice this. You must continue your writing. I’m confident, you’ve a huge readers’ base already!|What’s Happening i am new to this, I stumbled upon this I have found It positively helpful and it has aided me out loads. I am hoping to contribute & aid different users like its helped me. Great job.